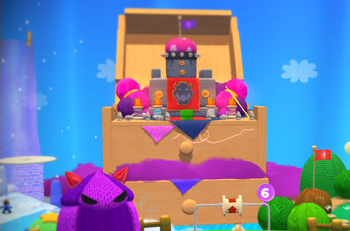 World 6 is the sixth world of Yoshi's Woolly World. It is a mostly volcanic-themed world, featuring elements related to lava and ashy clouds. As in all other worlds, there are nine levels: eight compulsory, and one special level that is unlocked after all other Smiley Flowers in the previous levels in the world are collected. Lair of the Smooch Spiders An underground level with many webs and Smooch Spiders. Snag-Stitch Mountain A mountain level with many Snag-Stitches. Vamoose the Lava Sluice! A volcano level that features many different paths and Lava Drops. Knot-Wing the Koopa's Sky Fort A fortress level where Knot-Wing the Koopa is fought a third time. Yoshi, the Terror of All Boos A mansion level with Frame Boos and ! Switches. Feel Fuzzy, Get Clingy A level that involves sticky conveyors and many Burrberts. Kamek's Last-Ditch Flyby A sky level where Yoshi must utilize paddle wheels and avoid Kamek to advance. King Bowser's Castle The final castle level, where Baby Bowser is fought. Skeleton Goonies' Lava Lair A special level in which Yoshi must move fast and avoid Skeleton Goonies. This page was last edited on July 10, 2018, at 07:21.